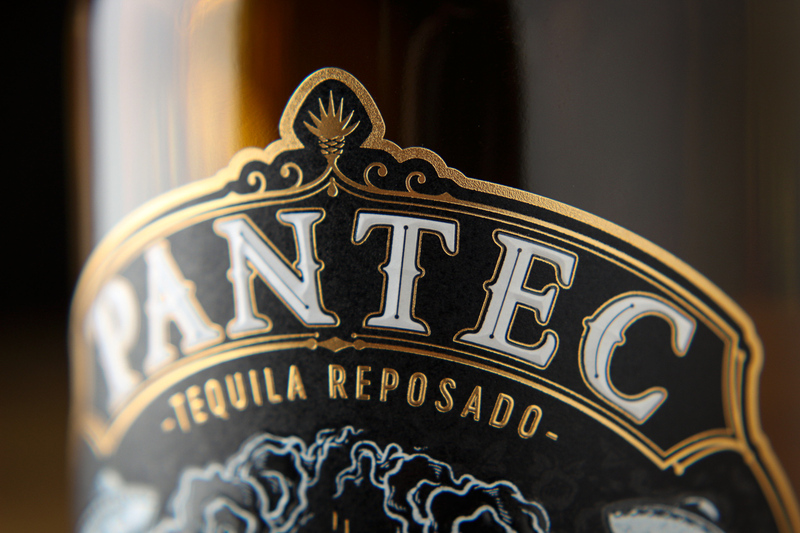 With a 70% performance increase compared to the legendary first RHINO™ introduced in 2010, Pantec offers a stunning fast running answer for the growing requirements for multi-effect foil-embossing. 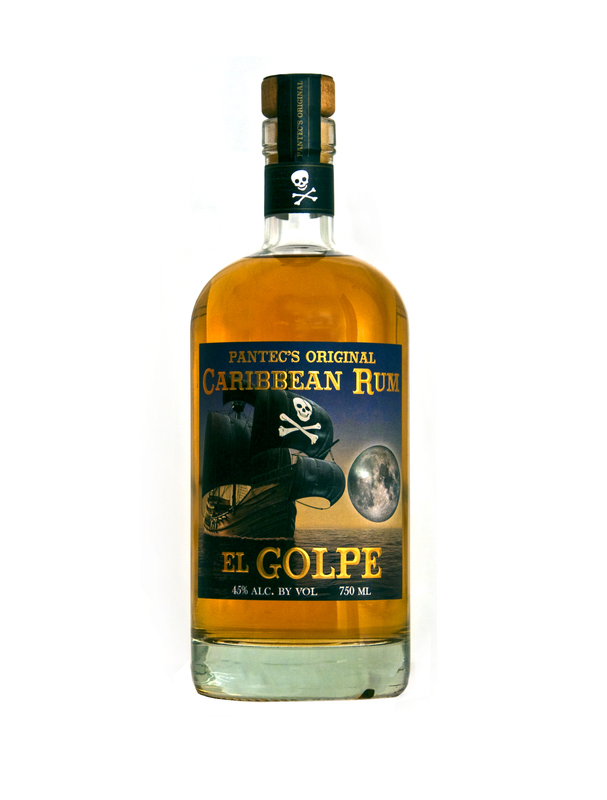 In the wine and spirits labels market, RHINO™ IIS best economy for single pass, short and long runs with small, inexpensive and quick setup tools. Kradolf / Switzerland – OCTOBER 11, 2017 – Within the last seven years, more than 80 RHINO™ flatbed embossing systems changed the world of wine and spirit label decoration. 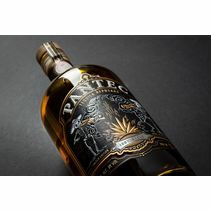 As traditional label refining with hot foil has a substantial influence on the production costs of high quality labels - and usually also increases lead times, the Pantec in-line capable RHINO™ flatbed multi-foil embossing system changed the production rules and allowed cost effective high end label production in a single pass. With the increasing demand of higher numbers of foil effects, a higher multistroke performance is required by a multi-effect decoration system to ensure an economic single pass production in future. 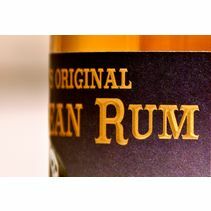 The 30’000 strokes per hour of RHINO™ IIS combined with a higher embossing tonnage ensure that labels with a high number of decoration effects and extraordinary demands on quality can be produced in-line without any loss of overall press performance. 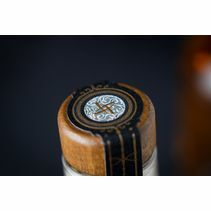 The flat bed embossing system RHINO™ offers everything the market for wine and spirit labels is expecting from modern embellishment, e.g. unique features like registered 3D foil and micro-embossing in combination with different foil colors: all combined on a single, small tool. With the Pantec servo technology, RHINO™ IIS registers 3D lenses at full speed, precisely. Due to the multi-stepping and the format-free multi-foiling of RHINO™, these features are done combined on one single tool, allowing the job to be run in-line in a single pass. Today, more than 80 RHINO™ flatbed systems help label printers worldwide to differentiate and offer complex designs cost effectively. RHINO™ systems are running in almost all presses: Mark Andy, Gallus, MPS, Miyakoshi, Nilpeter, OMET, Rotatek, Lombardi and fast running offline systems. 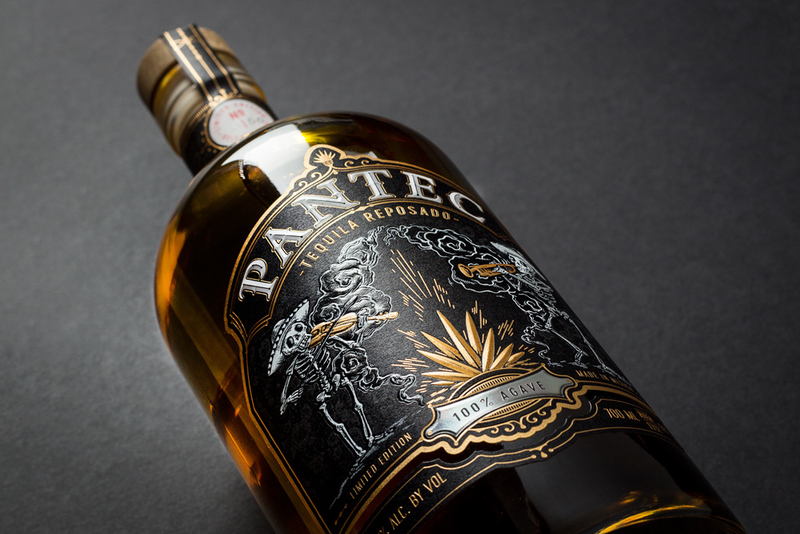 To underline the efficiency of single pass embellishment Pantec demonstrated the production of a sophisticated 3 foil rum label live at their booth with RHINO™ IIS. The design convinced with a precisely registered 3D effect lens, gloss-matt emphasizing with transparent foil and uncoated substrate and 3D beveled nanoembossed brand name. 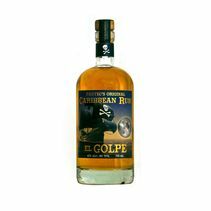 The label was produced with RHINO™ IIS at 30’000 strokes/hour, 70% faster than the legendary RHINO™ which was introduced in 2010. Especially uncoated structured papers with a rotary hot foil system slows down a press. The glue for cold foil is absorbed by uncoated materials. Matt gloss effects with cold foil are very limited. For striking embellishment effects, the use of a flatbed in rotary machines is the alternative. RHINO™ IIS is latest and most powerful of the RHINO™ series introduced in 2010. The RHINO™ IIS is a foil embossing system with 410 x 410 mm stamping area, revolvable head, 30’000 strokes per hour, registered hologram streams and 6 independent heating zones. It runs at 20% higher speed than RHINO II™ 410 introduced two years ago. The pay back inline is multiplied by the higher usage of the entire press. RHINO™ IIS comes with electronic impression control and higher tonnage. With RHINO™ II 250L, Pantec offers the ideal machine to start with. 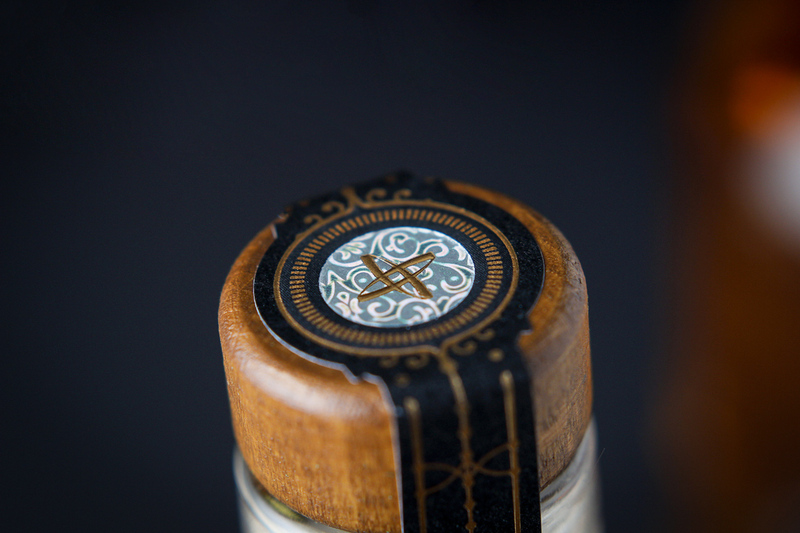 With 250 mm embossing length, the machine fits perfectly for typical 2 stroke wine and spirit label designs. The system is upgradeable to RHINO™ IIS 410 as business and requirements grow. The 330 mm wide RHINO™ 330W fits for semi-rotary machines. With 20’000 strokes per hour and a stamping length of 410 mm its suitable highest complex designs and small jobs. RHINO™ IIS will be available from February 2018. Increasing market demand for eye-catching, registered foil effects requires an efficient application in-line. Pantec demonstrated registered stamping of a registered 3D effect patch at 70m/min combined with 95% foil saving pattern. Kradolf / Switzerland – OCTOBER 11, 2017 – Brand owners have an everlasting interest for new features to make their products outstanding on the shelf, influencing the customers buying decision. Recently, 3D holographic patches are developing sharply. Brand owners get new options. Printers find Pantec SWIFT™ best suitable for efficient use in efficiency optimized production environments. Great marketing benefits of 3D holographic patches cannot be achieved with traditional off-line foil application methods. The cost per unit requires suitable inline stamping equipment. Pantec in Switzerland focuses on such in-line systems in narrow web and wide web. SWIFT™ allows previously impossible foil designs inline at high speeds combined with registered hologram patches. Depending upon the design requirements, SWIFT™ can be equipped with up to six registered hologram foils combined with independent foil saving pattern. Typical example: At its insetting performance of amazing 20 holograms / sec, SWIFT™ places a total of more than 200’000 patches per hour with three labels across the web. The high productivity is based on the unique vacuum foil motion system of SWIFT™. The system buffers the foil massless in a vacuum. No heavy masses are moving. 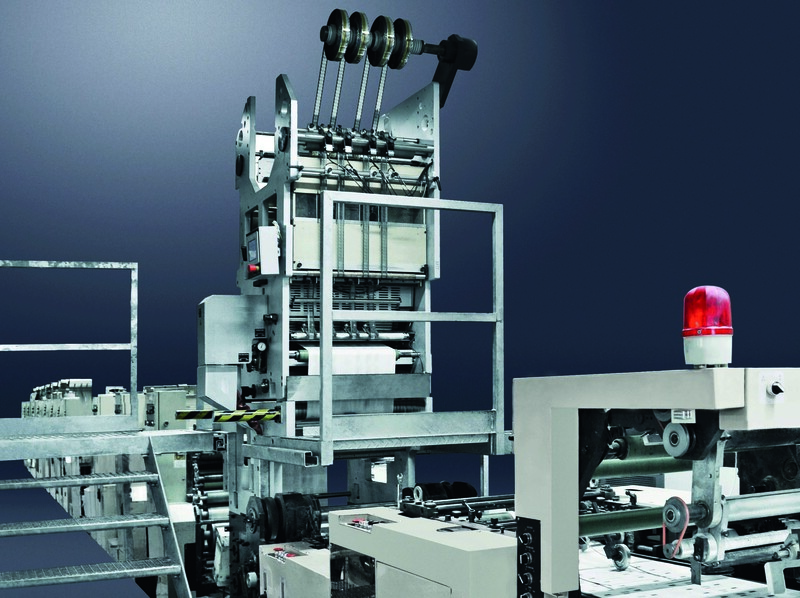 Pantec’s technology has already become is highly successful in carton packaging. It enables very high speed and still very high precision with registered patch placing. 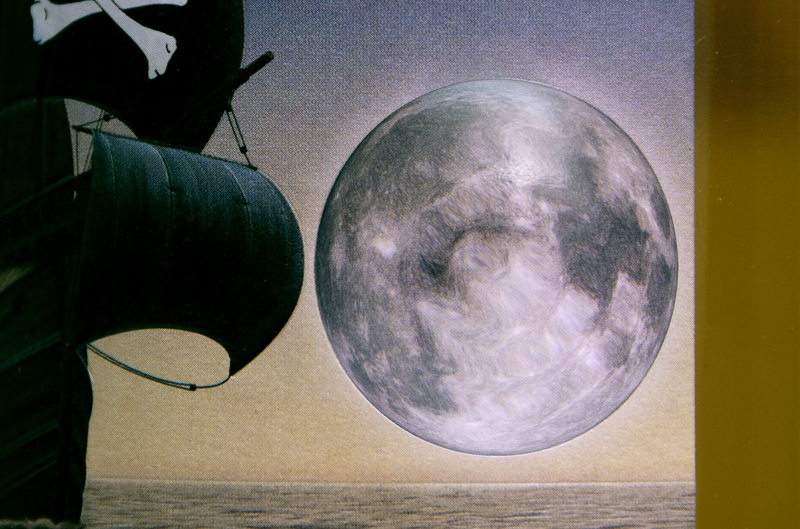 Designers know about the unconscious magic of centrically placed holographic designs. 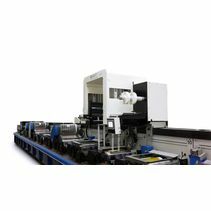 SWIFTTM works with movable vacuum walls, which allows changing the number of foil streams and width easily. The cassette change concept allows job preparation off-line and makes the set-up quick. 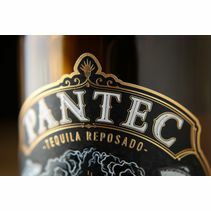 The Pantec foiling technology simplifies logistics and reduces costs. With a single generic type of registered foil all SKU sizes may be produced with SWIFT™. Design specific patch repeats are not required as SWIFTTM moves and places each foil patch individually. SWIFTTT™ uses 100% of the foil in a single pass. No stock management for partially used waste is required. Another benefit is the powerful saving on foil. 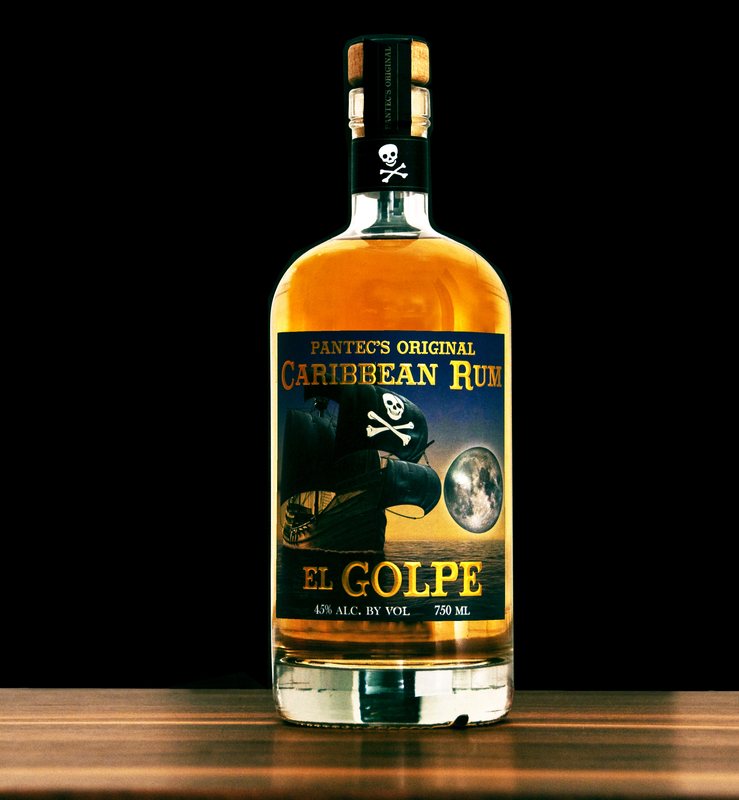 SWIFT™ demonstrated a saving of 95% compared to a normal cold foil application. The saving adds a significant plus to profitability. 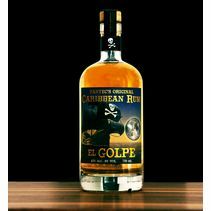 Often labels designer emphasize different portions on a label with the same shiny foil. Now registered patches are added in addition. 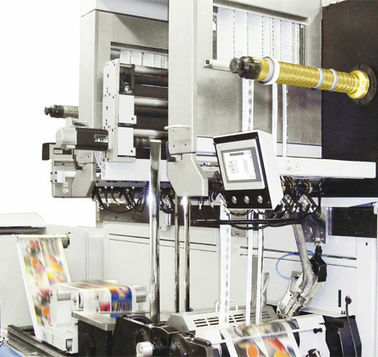 Normally, multiple foil applicators are required, which brings in higher complexity into the line. 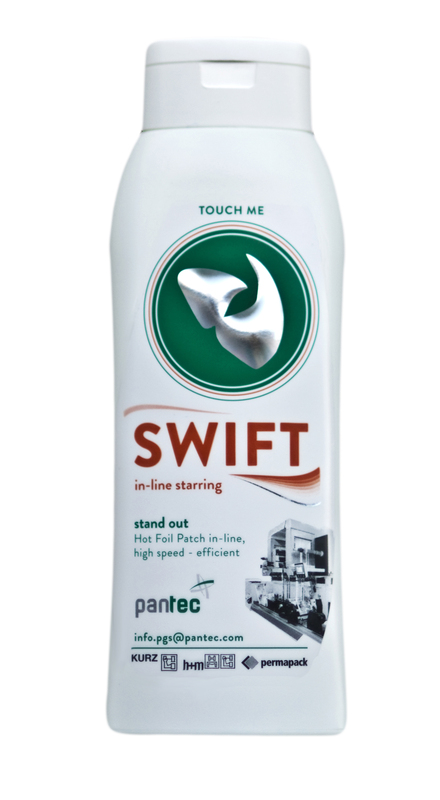 With the sample of an eye catching beauty care label Pantec demonstrated the performance of SWIFT™ live at LABELEXPO. A registered 3D spatial patch was applied in combination with a typical beauty care styled hot foil pattern, where SWIFT™ demonstrated a 95% foil saving compared to a typical cold foil application – all at an in-line web speed of 70m/min. During DRUPA 2016 Pantec GS Systems opened the doors at GEWA Etiketten, Germany for two times to demonstrate the single pass manufacturing of luxury packaging. International visitors of all kinds - printers, packaging designers and editors - joined the event. “The future in packaging: web, in-line, single pass” was promised to be seen. And GEWA delivered evidence by performing two impressive jobs, both in single pass from the blank substrate to the die cut pack. The first job was a highly decorated chocolate pack with complex foil embossing and blind embossing. 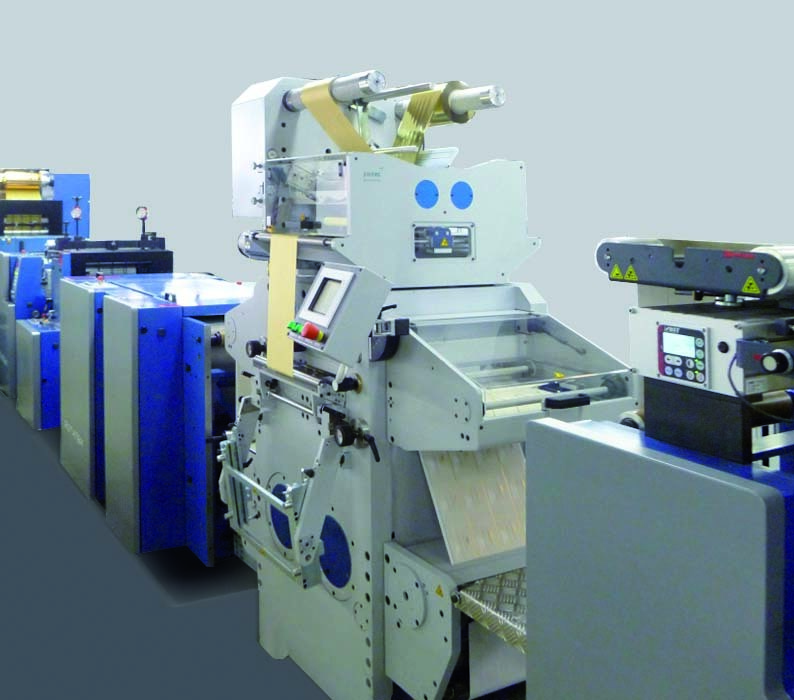 Even though the label press was not adapted for carton die cutting at this stage, a pharmaceutical job with an attractive security foil embossing was set up after completing the first job. The demonstration was performed on a narrow web Gallus press with an integrated Pantec RHINO™ flat bed hotfoil embossing system. After the demonstration, participants had a lively discussion with Mr. Uwe Refflinghaus (Managing director of technology at GEWA) and the former printer and head of production, Mr. Oliver Jung (now GEWA Designer). An essential outcome of the discussion was that in-line single pass operation is removing some of today’s cost limitations for packaging. The participants agreed that especially designers should know about the possibility of single pass manufacturing with the combination of printing (offset, flexo, screen printing) and high end refining (micro embossing, debossing, security features, die cutting), thus many of today’s limitations for designers would be cancelled. It was also interesting what wine label printers with seasonal jobs pointed out; they see potential to balance their business by the usage of the label press for highly decorated packaging jobs. Finally the enthusiasm and somewhat pride of the GEWA team was visible when the audience applauded their great work. To date high-quality luxury packaging is very expensive to manufacture, since the process is usually divided into several process steps. Refining with hot foil, holograms and embossing takes place in separate machines which splits the entire manufacturing process into several sub processes. This often means complex, time-consuming logistical processes and a lot of waste. In-line packaging printing opens up completely new possibilities for printers to produce cost effective with a very short lead time. New high-performance hot-foiling, embossing and hologram systems for web presses such as the rotary stamping system CHEETAH™ or the flatbed RHINO™ by Pantec GS Systems speed up to 150 m/min and produce POS teasing brilliance in-line. 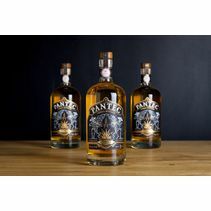 To show-case how luxury packaging can be manufactured in-line from the blank substrate to the finished pack Pantec GS Systems offer an open house onJune 3rd and 9th at GEWA near Frankfurt. Participants will see the combination of printing (offset, flexo, screen printing) and high end refining (foil & micro embossing, debossing, security features, die cutting) all in single pass from the blank carton roll - the future of luxury packaging! 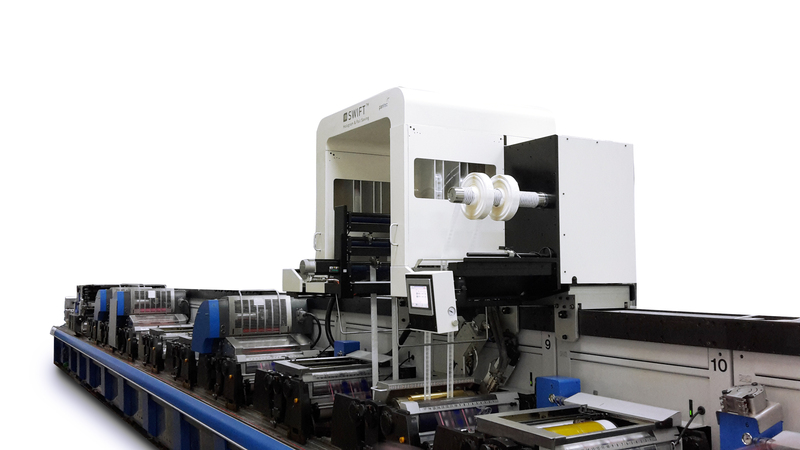 Pantec GS Systems announces the sale of an e-pack 850 off-line machine equipped with two CHEETAH™ rotary hot foil stamping and patch registration systems to HuanQiu in YuXi, Yunan province. This marks the 22nd CHEETAH™ sold to the Chinese market by the Swiss company, marking the increasing awareness of the benefits of web converting in the packaging industry. Peter Frei, CEO of Pantec GS Systems, is happy that the important players in the tobacco packaging market have recognized the potential of extending the web production from the printing to the converting process: “The Chinese tobacco packaging printers traditionally start from the roll on rotogravure presses and proceeded in flat bed sheet fed for converting. The high performance of the CHEETAH™ hot foil stamping system gave them the possibility to remain with roll material for the converting process – exploiting the benefits of shortened lead time, less waste and lower overall costs”. 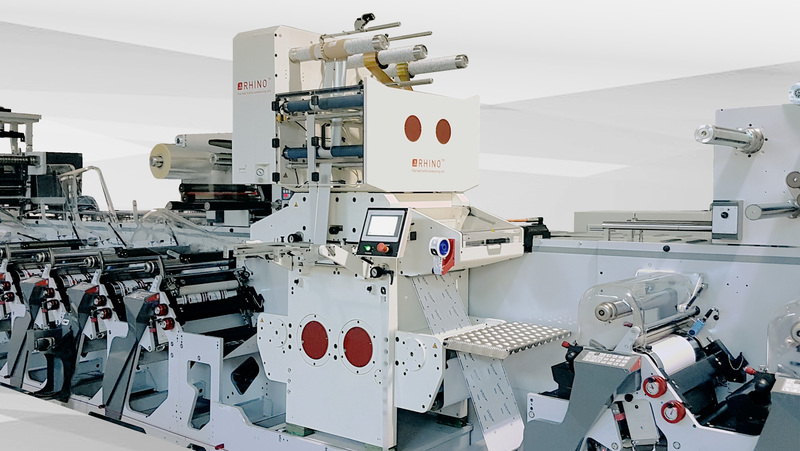 The recently signed contract for HuanQiu is for an e-pack™ 850 system, an off-line solution with two CHEETAH™ hot foil stamping and patch insetting systems. 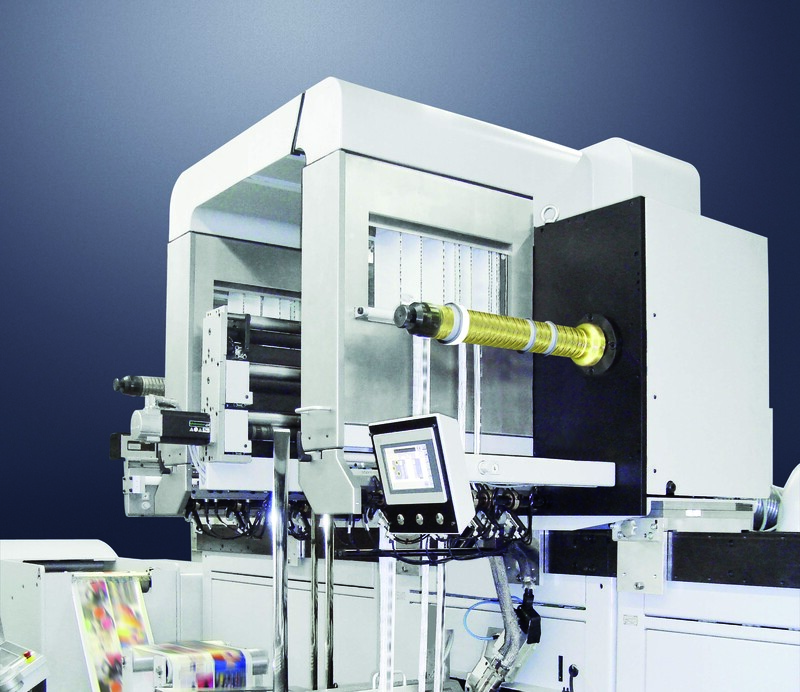 An important part of the installed CHEETAH™ systems is operating in-line in rotogravure presses. 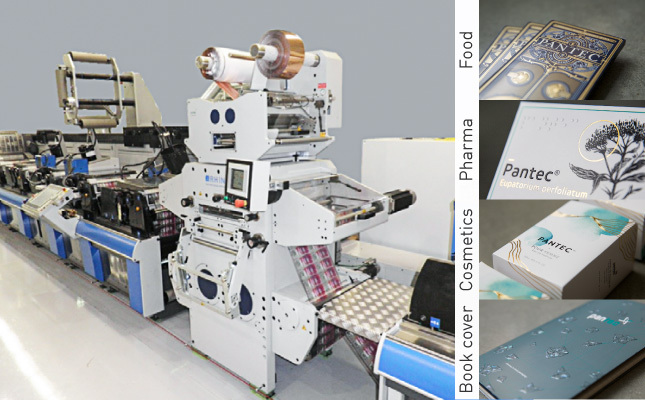 “With the unrivalled Pantec pSave™ technology, the massless foil motion system for fast and precise patch placement, CHEETAH™ achieves stamping speeds of up to 150 m/min”, says Frei. 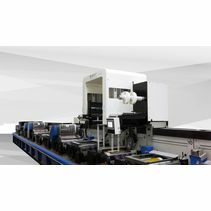 ”Now, hot foil stamping is done in-line in rotogravure presses of Komori and Bobst. The complete jobs, including hot foil and embossing can be done from the plane paper to the cut cardboard in a single pass”. Brady (NYSE:BRC), a global leader in industrial and safety printing systems and solutions, today announced that its brand protection business has purchased the SWIFT™ foil saver and hologram unit from Pantec GS Systems. The SWIFT unit will be used to meet an increasing demand in anti-counterfeiting labeling solutions from Brady’s customers. The SWIFT hologram applicator will be located at Brady’s secure manufacturing facility in Milwaukee, Wisconsin. Both this location and Brady’s Singapore facility operate under the ANSI/NASPO SA-2008 security standard. The Milwaukee location has been certified by North American Security Products Organization (NASPO) since 2004 and the Singapore location was certified in 2006, making Brady the first company outside of North America to receive NASPO certification. To learn more about Brady’s brand protection solutions, visit BradyBrandProtection.com. For Brady’s complete product offering, visit BradyID.com. Brady Corporation is an international manufacturer and marketer of complete solutions that identify and protect people, products and places. Brady’s products help customers increase safety, security, productivity and performance and include high-performance labels, signs, safety devices, printing systems and software. Founded in 1914, the company has a diverse customer base in electronics, telecommunications, manufacturing, electrical, construction, education, medical, aerospace and a variety of other industries. Brady is headquartered in Milwaukee, Wisconsin and as of August 1, 2014, employed approximately 6,400 people in its worldwide businesses. Brady’s fiscal 2014 sales were approximately $1.23 billion. Brady stock trades on the New York Stock Exchange under the symbol BRC. More information is available on the Internet at http://www.bradycorp.com. Aset-Bidoit, a leading French premium wine label printer, upgraded two of their Gallus TCS with RHINO™, a flat bed foil embossing system by Pantec GS Systems. Aset-Bidoit, already convinced by their first RHINO™ in a rotary press, wanted to bring its efficiency and quality also onto their semi-rotary presses. The retrofit of RHINO™ into the TCS is straight forward and simple. Pantec GS Systems technicians executed the entire retrofit directly by themselves. 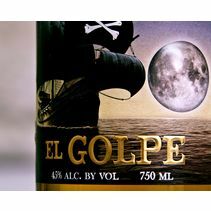 3D foil embossed labels are drawing significantly higher attention on the point of sales due to their outstanding appearance. 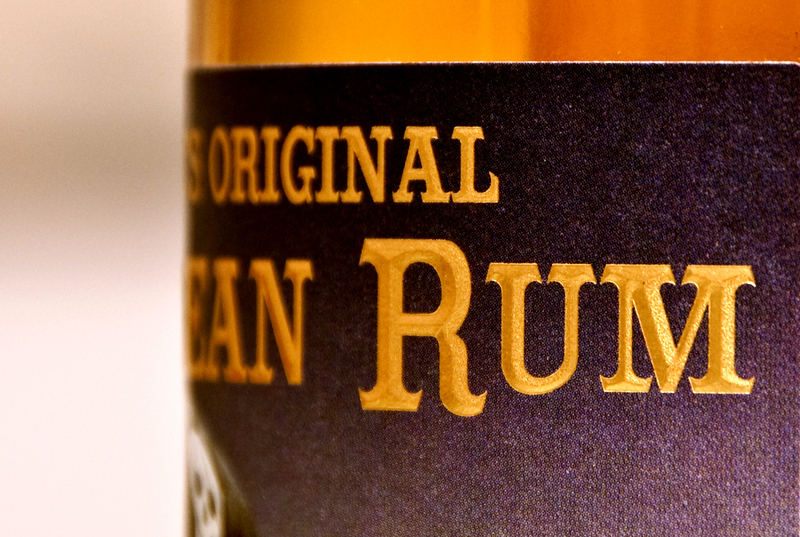 For these premium “flat bed embossing” look labels, inline efficiency was available for rotary systems only, so far. Now, semi-rotary presses can be equipped with the RHINO™ flatbed system also, achieving much more than just a leap in quality. 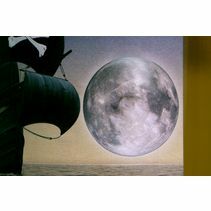 Rotary foiling is limiting the speed of the press, especially with uncoated and structured papers. The advantage of print repeat flexibility of semi-rotary presses results in partial usage of the printing cylinder circumference. Depending on the system only 50 to 80% is used. 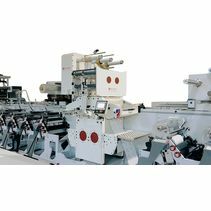 When talking about the press output on the roll, people often do not consider that the process speed on the cylinder may be twice as much, forcing the machine speed to be reduced for an acceptable quality. 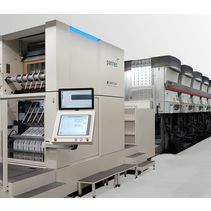 Pantec GS Systems, located in Kradolf, Switzerland, is specialised in efficient, high quality refining for the printing industry, providing leading in-line systems for Hot Foil Stamping and Embossing, Foil Saving, Hologram Application and Security Perforation. 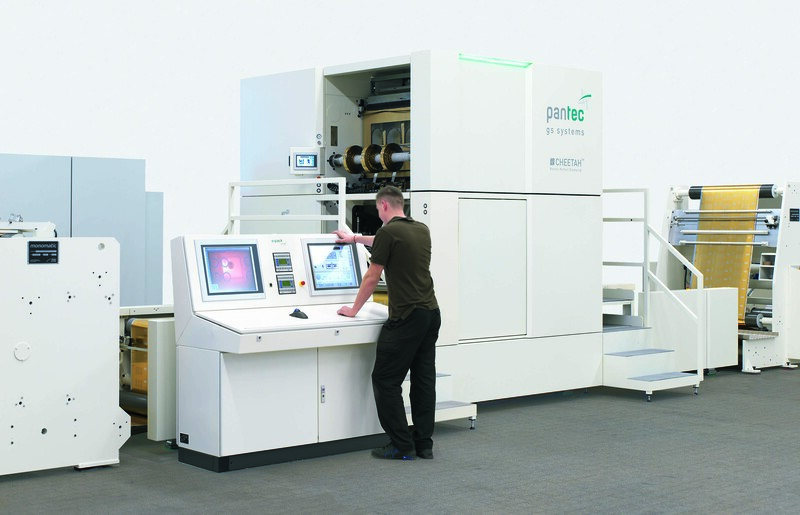 Market leaders reinforce investments to move from sheet to reel processing – Pantec GS Systems demonstrates machine performance in June at open day. Pantec GS Systems announces the sale of another two e-pack 850 offline systems with CHEETAH™ rotary hot stamping to Chinese Tobacco Packaging companies after installing four systems in autumn 2012 already at Goldroc Packaging Co., Ltd.
Pantec GS Systems will hold an open day at Goldroc plant in ChangDe, China, on June 20th to demonstrate the performance of reel fed refining for interested parties. Pantec RHINO™ foil embossing system integrated to Rotatek Brava at Austrian printer Marzek Etiketten. The by far largest wine label printing company in the eastern Austrian area, Marzek Etiketten, opted for a RHINO™ flat bed foil embossing system to be integrated to one of their semi-rotary Rotatek Brava presses, thus improving differentiation on short jobs. For Marzek Etiketten, the outstanding look of 3D foil embossed labels is a further development of their differentiation skills on low volume jobs. The integration was done into a Rotatek Brava press, adding RHINO™ for high speed refining. The integration to ROTATEK Brava updates Pantec GS Systems list of RHINO™ with semi-rotary machines after equipping several Gallus TCS presses already at Aset-Bidoit, France. The pressure sensitive label market is getting under price pressure from different directions, more and more. Numerous printers compete for smaller and smaller orders and shorter and shorter lead times. The prices and margins suffer. Differentiation and efficiency become the key to escape the price spiral. 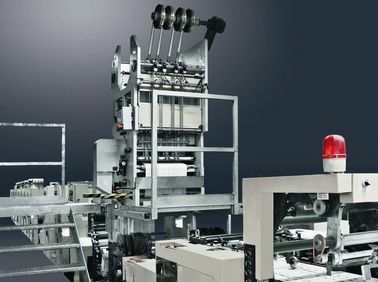 After RHINO™, the paradigm-changing flat bed foil embosser in rotary wine & alcohol label presses, the Swiss company Pantec GS Systems already launches another innovative system for foil printers. SWIFT™ is one of the most agile birds of the Alps flying along steep ridges. So does the new Pantec foil saver. It “flies” along the rail of modern printing machines. SWIFT™ is designed to make specialist printers in cosmetic and health much more cost efficient and more over, it allow them to differentiate in quality from their competitors. At Labelexpo Americas Peter Frei, CEO of Pantec GS Systems, will show the economic and the quality factors that make RHINO™ and SWIFT™ users have a key advantage that improves their market position and increases their margins considerably. 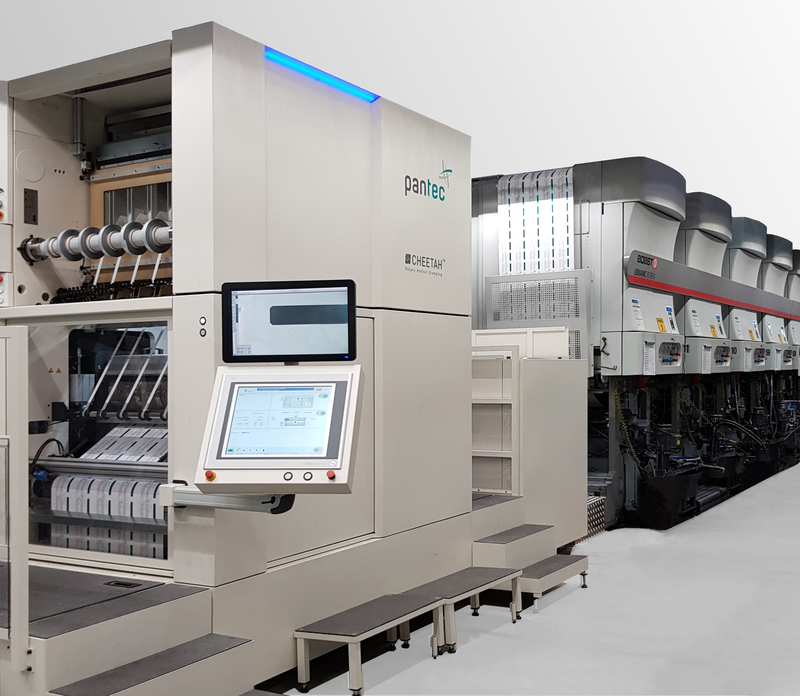 After RHINO™, the paradigm-changing flatbed foil embosser in rotary wine & alcohol label presses, the Swiss company Pantec GS Systems already launches another innovative system for foil printers. SWIFT™ is one of the most agile birds of the Alps flying along steep ridges. So does the new Pantec foil saver - SWIFT™. For rotary foiling SWIFT “flies” along the press’ rail if required for a job change. 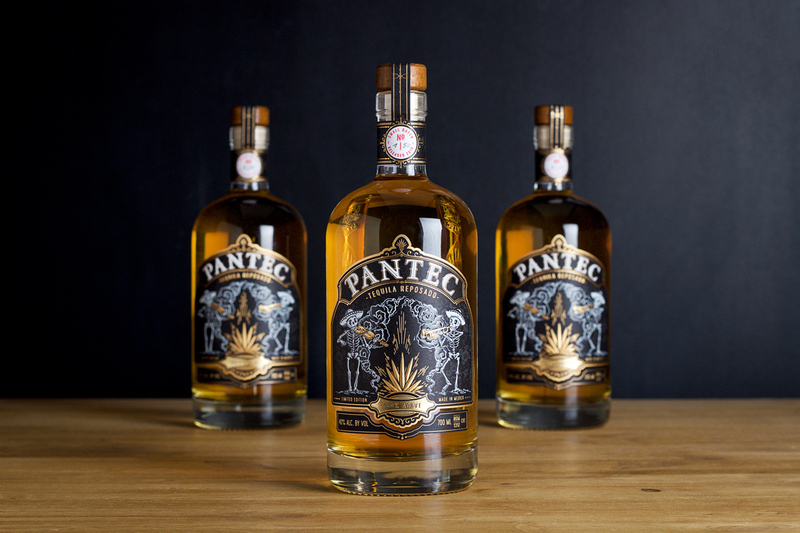 Pantec GS Systems is about to launch SWIFT™ after Labelexpo Americas. SWIFT™ will be available for most of the modern leading printing machines. SWIFT™ is designed for fast change over. It has been developed with the advices of specialist printers in Health & Beauty to be versatile for innovative marketing needs, but above all, meeting today’s stringent requirements of small orders. 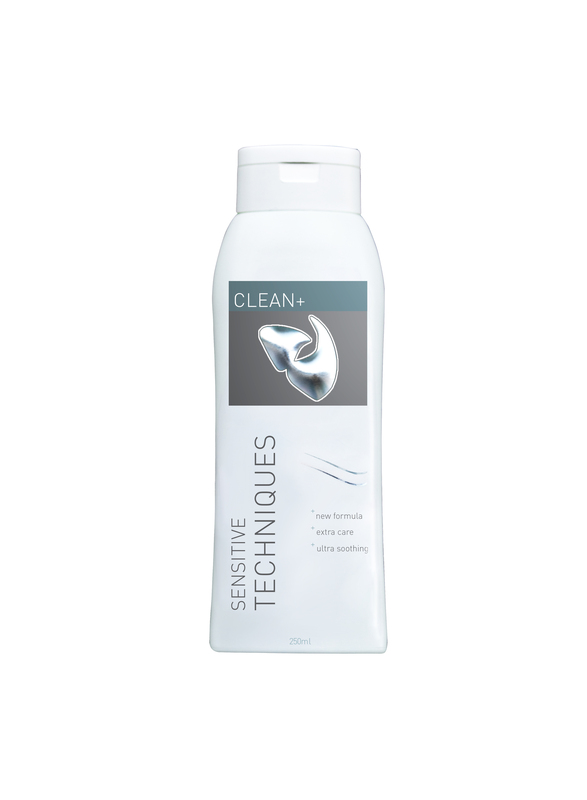 SWIFT™ is based on Pantec's high performance vacuum saving technology pSave™ which achieves extremely high frequencies, allowing to run the press at typical Health & Beauty label printing speeds. 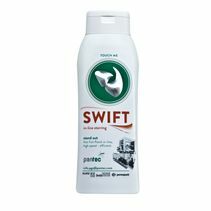 A major field of application for SWIFT™ is Health & Beauty, as their label production shows a very high foil saving potential. Specialists running multiple shifts have profit potentials of hundreds of thousands of Euros per year. They can profit not only from foil saving with hot foil. They profit from reducing foil change stops, thus waste and time of a high value press. 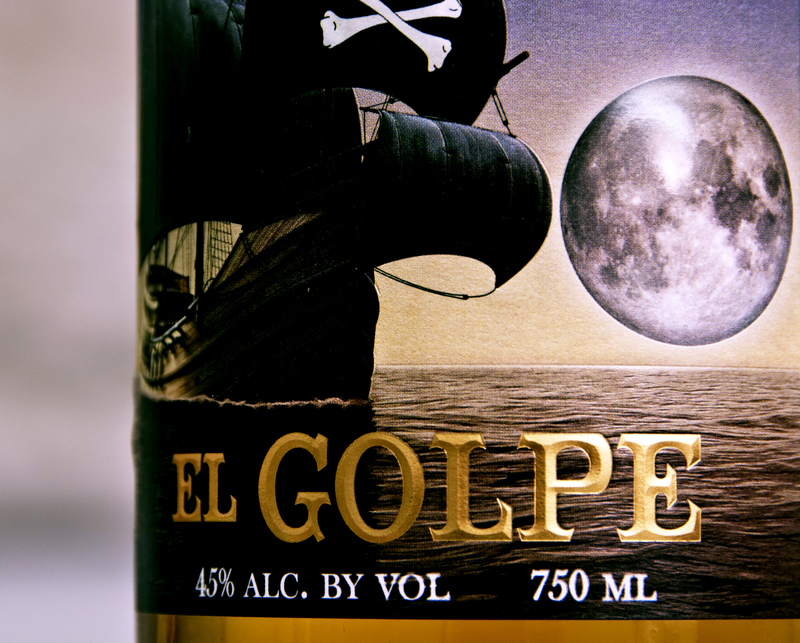 Moreover, moving from non-saveable cold foil to hot foil becomes very attractive. Foil saving and therefore less line stops, compensates not only the tooling cost, but creates high additional profits on repeat jobs. Furthermore, it adds competitiveness from the higher quality of hot foil. Pantec GS Systems, located in Switzerland, is specialised in efficient, high quality refining for the printing industry, providing powerful in-line systems for specialists in Hot Foil Stamping and Embossing, Foil Saving, Hologram Application and Security applications. 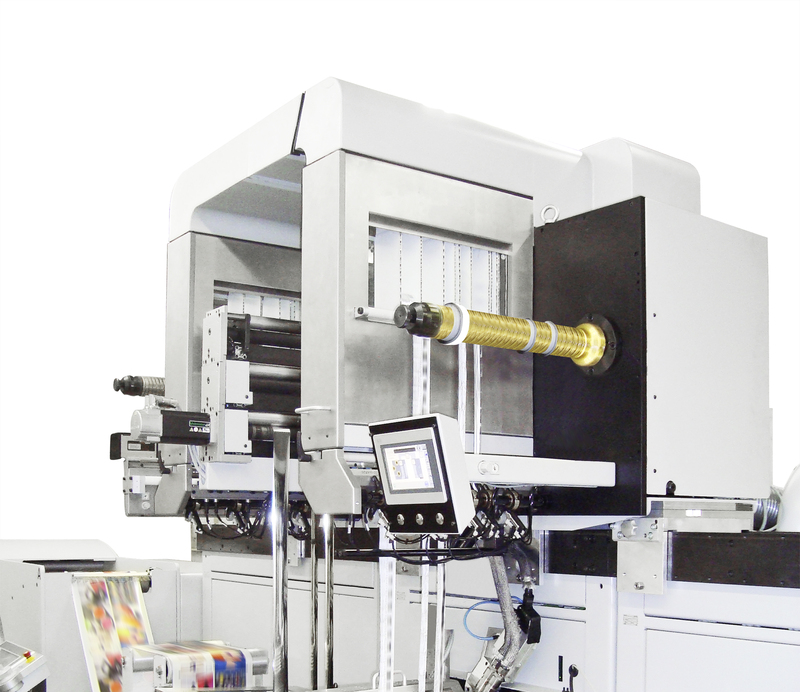 Pantec GS Systems, a specialist in efficient high quality refining, announced that they have sold four E-PACK 850 offline systems with CHEETAH™ rotary hot stamping to Chinese Goldroc Printing Co., Ltd. According to Steven Ye, Chief Representative of Pantec GS Systems in China, Goldroc’s decision is based on a major trend in the market which will highly affect the whole Chinese tobacco printing industry in midterm. For Peter Frei, CEO of Pantec GS Systems, this paradigm change opens substantial business opportunities in the Chinese market: ”We are proud that Goldroc has chosen the Pantec GS Systems p-save vacuum technology for high performance hologram stamping. The success in ShenZhen with the integration of CHEETAH™ in offset lines in 2010 for mass hologram application on V.A.T receipt has proven the power of p-save vacuum technology”. CHEETAH™, a rotary hologram application system by Pantec GS Systems, was installed about one year ago in DongPeng, a printing company governed by Shenzhen tax department, in-line into an existing flexo printing machine. Aim of the project was to set a new security standard at high efficiency level for tax invoices as they are produced – and faked - billion fold in China per year. A newly developed hologram foil in combination with CHEETAH™’s high speed and very precise hologram application finally persuaded the DongPeng Managers. From today’s point of view the result is convincing: “Up to now, there has been no fake invoice to appear in the market, this is an exclusive record in the history for whole China and it’s just incredible and exciting", DongPeng officials stated. CHEETAH™, a rotary hologram application system by Pantec GS Systems, installed in DongPeng, a printing company governed by Shenzhen tax department, in-line into an existing flexo printing machine.